Earlier this week, the folks at Lenovo confirmed the presence of the Ideapad A10 notebook, but the company didn’t mention the specifications of the notebook nor its pricing and availability date. Earlier today, the Chinese laptop maker officially announced its first Android-powered notebook, Lenovo A10, which can also be used as a tablet. The notebook features a 10.1-inch display with a resolution of 1366 x 768 and is powered by a quad-core Rockchip RK3188 Cortex-A9 processor with a clock speed of 1.6GHz, 2GB RAM, 32GB storage with a microSD card slot and runs Android 4.2 Jelly Bean on top of it. According to the manufacturer, the laptop’s battery is expected to last for almost nine hours of continuous video playback. Lenovo A10 also offer users with two modes: stand mode and laptop mode. In the stand mode, the notebook becomes a tablet, which is optimized for touch-enabled apps. 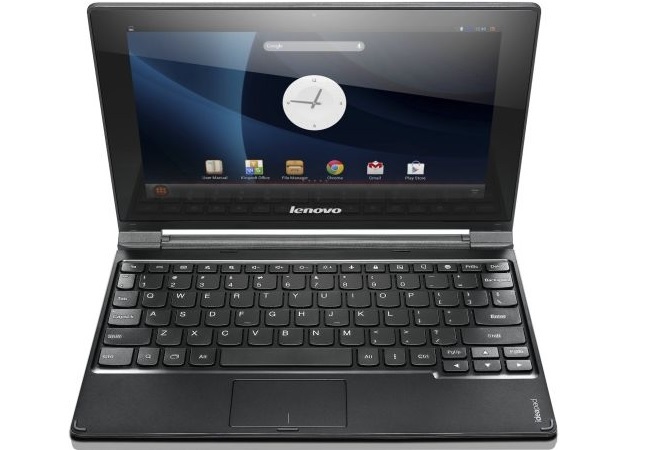 In the “laptop mode”, the tablet makes users of the custom Lenovo UI, which provides an app launcher, task bar and status bar for quick access, as well as sime multitasking. There are no details about the pricing and availability of the notebook, but the folks at the Chinese OEM mentioned that it varies with region. It seems that the tablet will not hit the shelves in the US, but it would be available in Africa, Asia, Europe, and the Middle East, and shouldn’t cost a couple of hundred bucks.